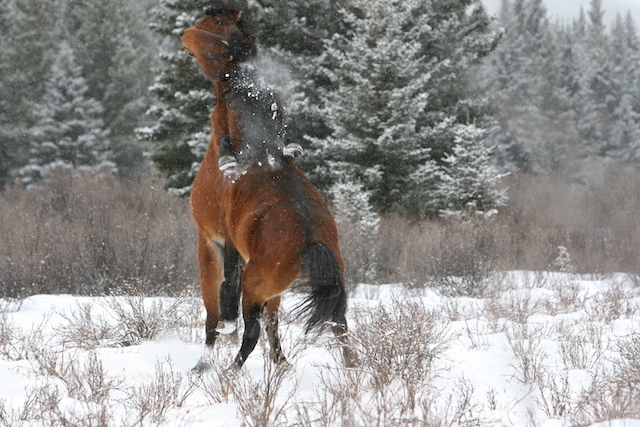 The life of our Alberta wild horses is not an easy one. They face many obstacles and events as they attempt to survive in what is sometimes a hostile environment throughout their life. 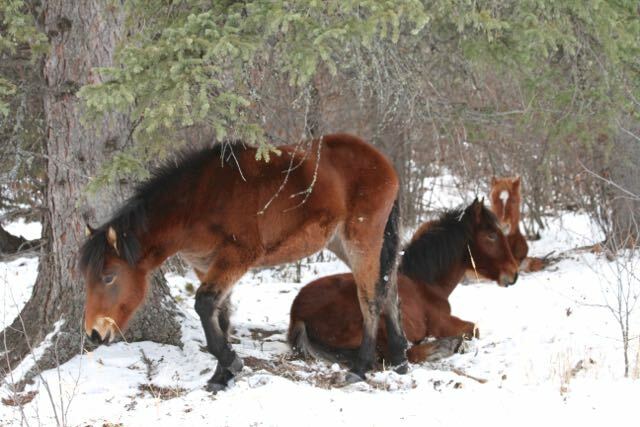 We found this 2 – 3 week old filly looking healthy and nursing off of mom as she foraged for feed. 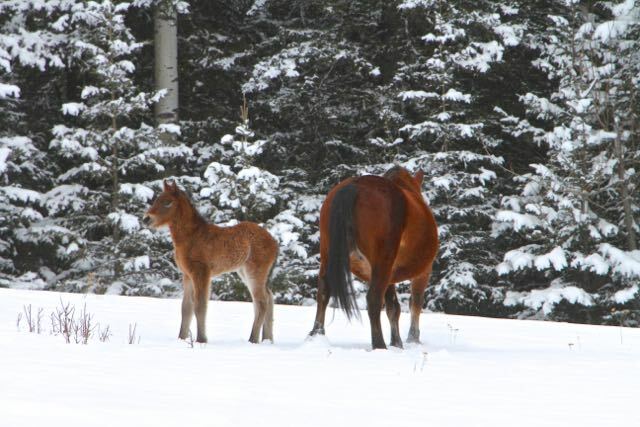 A fresh snowfall had again blanketed the land making it a little harder for mom and the herd to find food and the foal to stay warm. 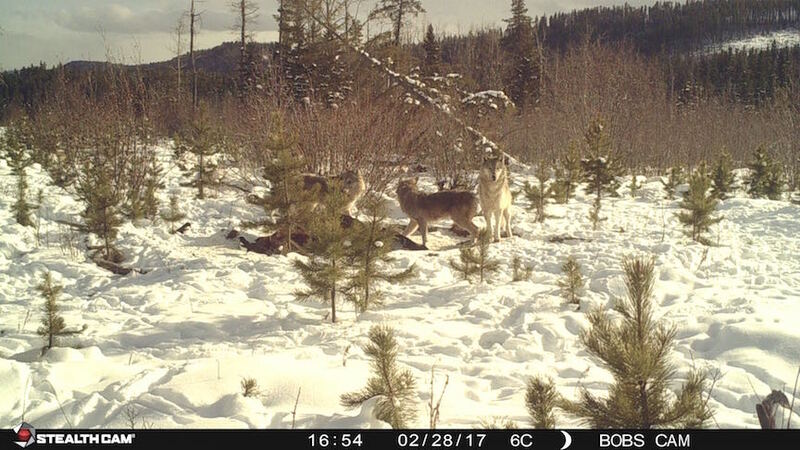 The foals from last spring are doing well as you can see by these three who were resting in the protection of the trees. No matter what age though injuries can be caused by a misstep or a kick. Young studs are always testing each other and most times the skirmishes end peacefully, but occasionally one of the combatants will get injured. Most times too the horse will recover. Occasionally however the injuries can be severe and the chances, as is often the case in Nature, of the animal surviving can be slim. Many other factors affect life of the horses as well, from old age to severe weather, such was the case in the winter of 2013/14. Some officials would like the public to believe that the horses have no natural predators. For those of us that spend considerable time travelling throughout wild horse country, documenting the horses we know this is not true. 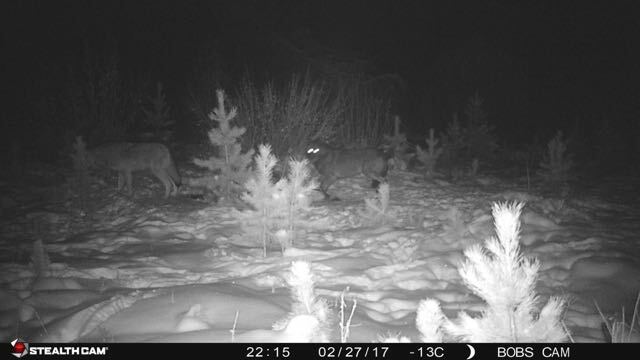 In fact one University of Alberta researcher who had collared a male cougar, documented that that it’s main prey was the wild horses. Bears and wolves if given the right opportunity will also take down an old, young or injured horse. Most times though the wolf and the horse co-exist, such as seen here where this wolf walks past a very calm and healthy young stud. On our travels last week we noticed ravens, the messengers of the forest, circling in the distance. We know from experience that this signals something dead. We went to find out what it may be that attracted them. As we approached, even a bald eagle singled his displeasure. 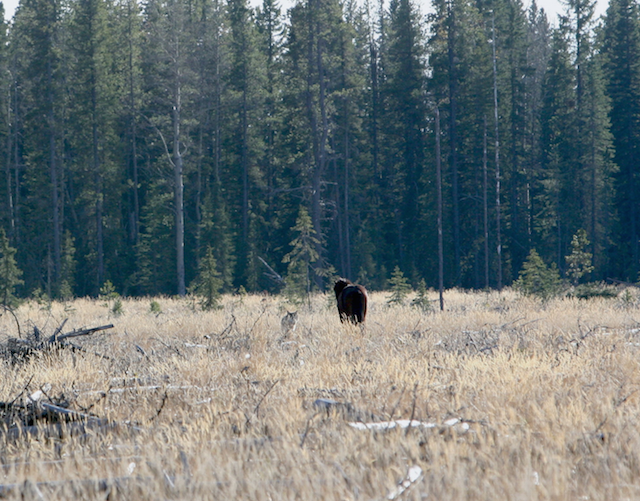 When we arrived on the scene we found a wild horse mare who appeared to be old and likely killed by wolves. All the telltale signs were there to indicate this, including lots of wolf tracks. We know this is just part of Nature and have come to accept this fact. We decided to set up our trail cam to see who came to feast. We left it there for a few days and just want to show you all the animals and birds that utilize what Mother Nature provides. 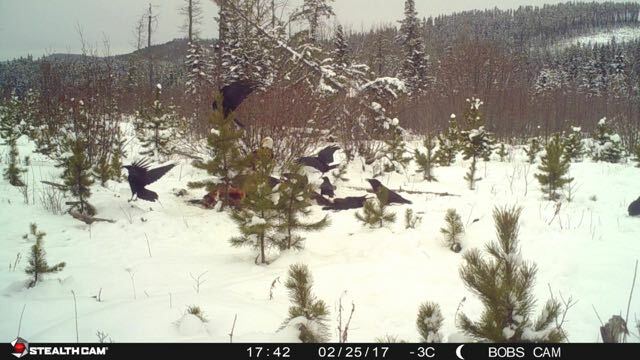 Of course there were many ravens. Those sitting on the ground feeding; those sitting in the tree keeping watch, and then those circling high above. The bald eagle came flying in to take over and push the ravens out. 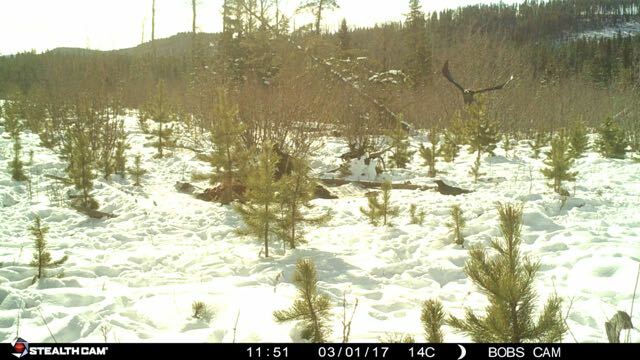 The camera also caught golden eagles coming in several times. 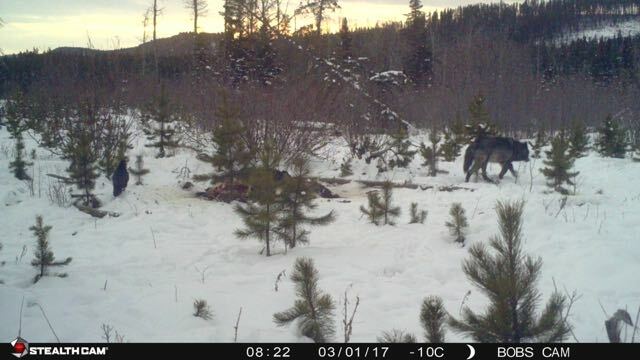 Can you see the second one on the carcass? 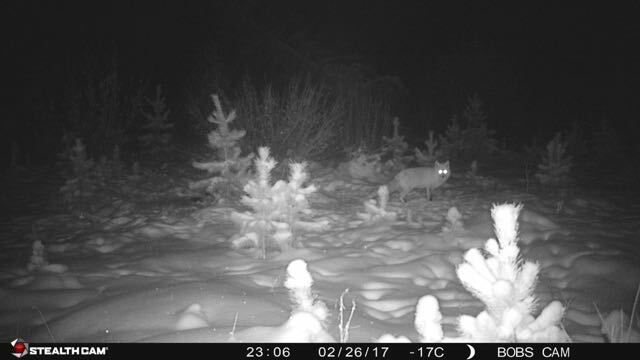 During the nighttime the camera caught many different visitors. They included the wolves, foxes, coyotes and even a glimpse of a fisher, which is a very elusive, small nocturnal predator. It was very telling by sifting through the hundreds of photos, the hierarchy of all the predators photographed. The foxes would sneak in whenever the wolves moved away from feeding taking their turn. 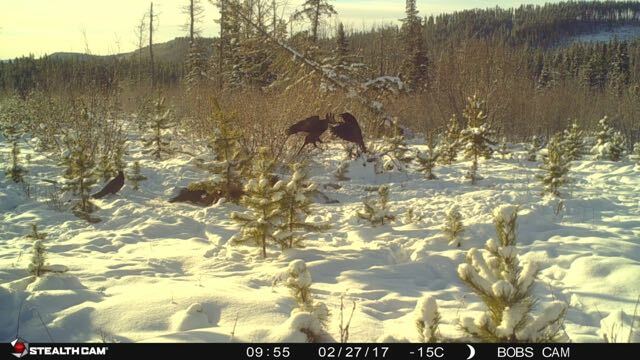 The first picture shows two of them arguing over who goes first! 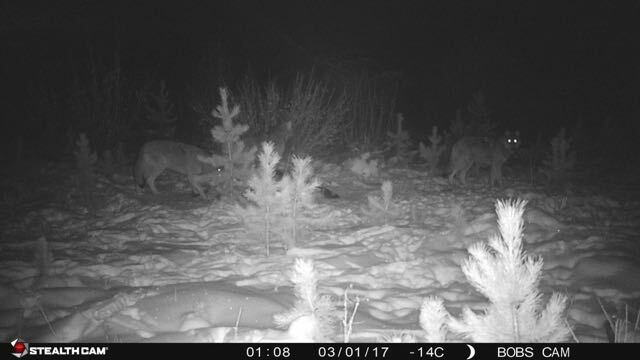 The wolves would also move in during the night with two different groups. We believe they are from the same pack. These pictures show the group with the large black wolf. The wolves would also visit the kill in the early morning and then back again in the late afternoon. 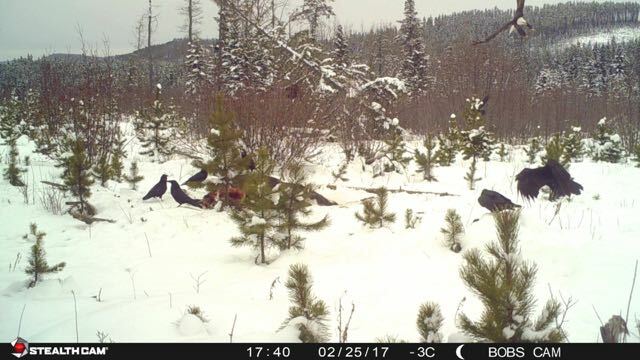 As the black wolf moves off, the pictures show it did not take long for the ravens to come back in. This young wolf came by himself and upset at the ravens, leapt in to chase them away. Some say the horses do not belong out there. But after spending years documenting and observing them, it is obvious to us that they have become an integral part of the ecosystem as it exists on today’s landscape. Even in death they play a role. And everything has its place, including the wolves who are also persecuted. Great article! Especially liked the last paragraph: “…and everything has its place.” Wonderful work!